October | 2011 | It's a Miracle! “These deaths are not unusual at all…Sometimes the influx of patients is so high that three, four, five can die. Sometimes 15 can die.” – M.K Chatterjee, Superintendent, BC Roy Memorial Hospital for Children, Kolkata, West Bengal, India. There is a proverb in Bangla – “kings fight it out with other kings while irrelevant commoners lose their lives.” At the premier tertiary healthcare hospital in one of India’s major cities, babies are dying every day. In response, the media, general public, government, and healthcare establishment are reacting precisely as they have in the past. You can pick up newspapers from previous decades and genuinely think that the events are current. The names of the dead have changed. But no one other than family members remember the names of the dead. We’ve seen it happen before many times. When the Left Front ruled the state, we excoriated erstwhile Health Minister, Dr. Suryakanta Mishra for saying, “there is nothing abnormal in the number of deaths that have taken place,” immediately after 14 children died within the span of two days in 2002 at the BC Roy Memorial Hospital for Children in Kolkata. At that time, the leader of the Opposition, Ms. Mamata Banerjee took to the streets to protest the callousness of the government. Reams were written in daily newspapers. Experts waxed eloquently on what needed to be done on televised talk-shows. We seethed and gheraoed those who we could find. And then we moved on to other matters. The children were still dying every day. In May of this year, the Trinamool Congress swept into power at the state on the promise of changing the policies of decades of Left Front rule. Over the short span of two days in June, 22 children died at BC Roy Memorial Hospital. This time, Dr. Mishra, who was now a leader of the Opposition, wasted no time in blaming Ms. Banerjee for failing to provide adequate healthcare in the state. Ms. Banerjee ordered an inquiry after which she, (and excuse the pun), issued a clean bill of health to the hospital. After a few days, the newspapers will move on to other stories. The children will continue to die. Let us step back for a minute to focus on the broader state of healthcare in India, and in West Bengal in particular. The Organization for Economic Cooperation and Development notes that India currently spends around 1% of its gross domestic product on healthcare, which confers on it the dubious distinction of ranking eighth from the bottom. When we consider how we treat our most vulnerable citizens, the situation is even bleaker. One universally-accepted healthcare metric is the infant mortality rate which denotes how many babies under the age of one-year die every year for every 1,000 live births. Most advanced nations have an infant mortality rate which is less than 10. India’s current infant mortality rate is estimated to be around 57. The infant mortality rate in West Bengal, which is 35, is actually lower than the average for India, and has decreased by approximately 40% over the last decade. The progress that has been made is admirable, but beating the average is no reason to gloat, especially when the average is abysmal. More than 400,000 babies die within 24 hours of birth in India – the highest for any country in the world. 5,000 children under the age of five die every day. Malnutrition among prospective mothers leads to underweight newborns, who are especially susceptible to infection. The most tragic aspect of this vicious cycle is our children are dying not from incurable diseases but primarily from infectious diseases for which treatments have been available for decades; they are dying from gastroenteritis, encephalitis, diarrhea, and pneumonia. I did a back-of-the-envelope calculation of the number of infants who will die this year in West Bengal based on the reported data – the infant mortality rate for the state and the population increase though live births – and came up a range of 50,000-60,000. Incidentally, this number is higher than the number mentioned by the Chief Minister, Ms. Banerjee (40,000). If we consider the entire range of these numbers then we can predict that currently at least 110-140 infants under the age of one are dying in West Bengal every day! And this number is almost certainly an underestimate. In addition, it does not include many of the children who are dying after surviving for a year. I then decided to examine the unfortunate statement of the superintendent of BC Roy Memorial Hospital, Dr. Chatterjee that “the influx of patients is so high that three, four, five can die.” It was difficult gauging an accurate number of outpatients and admitted children who are being treated by the hospital every day. One news-story claims that one pediatrician examined 500 patients in one day. If we take this to be an anomaly, we can consider the more conservative number of patients as roughly 1500 treated every day from a recent report. The data then suggests that one sick infant for every 300 who is treated, dies at the hospital every day. And so while the current deaths at BC Roy Hospital worry me, I know they will continue unless the healthcare system is overhauled across the state. I request the media to consider the following questions. Why does the state website report that there are only 924 filled positions in primary health centres and 1069 are lying vacant? Why is there a continuous stream of patients who feel that they need to go to Vellore, a small Christian medical college hospital in South India, to get proper treatment because they get none in their own? Why are instruments unused and beds lying vacant while seriously sick patients lie in corridors with dogs and pigs? Why are physicians employed by hospitals spending more time for their private practice at nursing homes? These are the stories which every person who grew up in West Bengal can narrate. Tell these stories. Focus on the deaths every day until we are shaken out of our stupor. Don’t move on. Note: here is a brief history of the photo which everyone on Facebook and even news-organizations are sharing as a photo showing the night sky over India on Diwali. 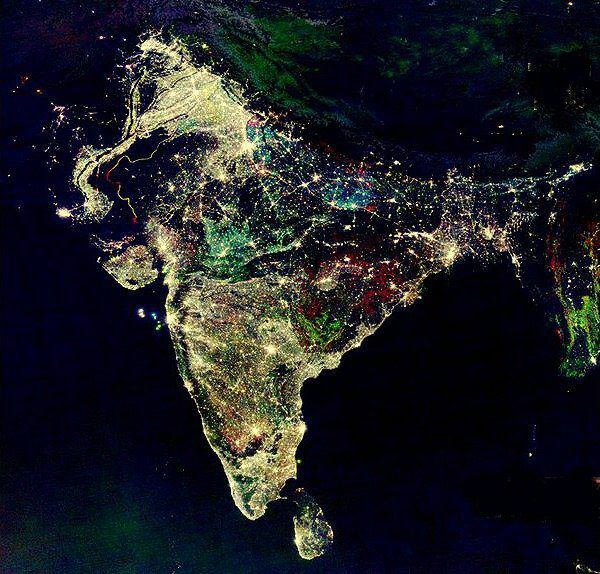 It is a composite image taken over many years to show the changing patterns of lighting usage in the country. It is a false colour-image using a technique quite standard in remote sensing and GIS. Satellite data from 2003 is coloured red, 1998 is coloured green and 1992 is blue. Also, it was cloudy and did rain in parts of India. Something which would have shown up in a one-day snapshot taken by any satellite. In fact INSAT-3A does have cloud coverage imagery for that date. Although I never asked my parents, I know that leaving India was difficult for them. Fresh out of India’s premier medical institution, they left, along with a majority of their peers, to fill a dearth of specialized physicians and medical researcher positions in the United States in the late Seventies. While in the United States, every week they would write letters on blue aerogrammes which would take two weeks to reach my grandparents. They filled the margins with scrawls in Bangla and read over the responses received over and over. Sometimes, they would go on long drives in the countryside. My mother would listen to songs of Tagore pensively. My father would find lakes where he would go fishing just as he had in his childhood. When they saw another desi – perhaps a lady wearing a sari in grocery store, they got visibly excited. From what I can gather, it didn’t happen very often in suburban Texas back then. In the Eighties, we all moved back to India. It was a different India back then. There was no cable TV at the time. You couldn’t buy a decent pair of jeans in the country or a bottle of Coca-Cola anywhere. Very few movie theaters showed movies from Hollywood. Thomas Friedman would have hated this India. And so my formative years were spent in both the United States and in India – two countries in which I have spent roughly an equivalent amount of time. My parents never told me that they had been homesick. They didn’t have to. When I decided to leave for the United States to get my PhD, I knew exactly what they had felt decades earlier. I was educated, upwardly-mobile, as fluent in English as any native speaker of the language, and as capable as the other researchers in the academic setting I would be joining, but I felt a bond with those who had left Calcutta for places as distant as South Africa, Guyana, Mauritius, and Fiji a century earlier. Perhaps, even those who left as indentured laborers kept a spark of hope in their hearts that they would someday be returning to the country of their birth, even as the passing of seasons made it more improbable? My generation is not disenfranchised like the earlier generations of immigrants who were indentured laborers. But are we completely in control of our fates? No one wants to admit it, but moving to any country is more an impulsive decision based on random life-events than a calculated undertaking. Situations change and we rationalize based on the outcomes. Go to any party attended by first-generation desi immigrants who have lived in the United States for a few years and you will run into people who have bought homes and apartments in India with the goal of returning someday. Who knows if they ever will? I am like those party guests. I can never completely rule out returning to India without acknowledging that I would have to abandon my parents and family for good. That is a price I am not ready to pay. I am fine with those who decide to stay in whatever country they are most comfortable in and whatever rationalization they use to justify their decisions. For me, it is not about the traffic. It is not about who does my laundry. I remember the day Rajiv Gandhi was assassinated quite well. There were framed photos of the man on street corners with garlands hanging from them. He was smiling in most of the photos and wearing a white kurta. Women were crying. Men were shell-shocked. It didn’t matter what your political inclinations were. It didn’t matter what you thought of the man. The sadness was palpable. Frontline ran a story with graphic images of the dead in the aftermath of the explosion. Sriperumbudur, the place where Rajiv Gandhi died was a horrific sight. There were bodies strewn everywhere. There were bodies without legs. Torsos without heads. And there was a picture of the man, Rajiv Gandhi himself, or what remained of him – a rump covered by a tattered piece of cloth. Probably a piece of the white kurta he had been wearing. It was the most horrific photograph that I had ever seen in my life. What were the editors of Frontline thinking the day they published it? Death and dismemberment are real. Vultures swoop down on corpses at Parsi dokhmas. Tibetans show their compassion towards animals by opting for sky-burials. Ashes to ashes. Dust to dust. That which is not cremated is returned to the mahabhuta. That is the order of things. But there is solemnity in death. It is the end of the line for all of us. Is it, not natural therefore, that we, the living, show a modicum of respect for the dead? Another day, another bomb blast. Bloody streets in some part of the world. Or perhaps, a dictator is dead? Where is the proof? He was killed. No, he was caught or killed. No, he was caught then killed. These questions are inconsequential. He was despicable. No one will miss him. How many ways did he spell his name in a language he did not speak? Meanwhile, we boast about not flinching while watching movies in which humans are stitched together. About how we score headshots with a rocket-launcher on video game adversaries. Every mirror hides a camera. Every wall hides thousands of microphones. In Barrackpore, a housewife and her paramour were shot down by her husband in broad daylight. Then he shot himself. The photograph of the deceased lying in a pool of blood in a dirty bazaar on the front page of a newspaper is what I see in the morning. There are flies everywhere. The accompanying story mentions that the kids were not at home at the time. There were kids? I plug my ears, but the screaming reverberates inside my head. I close my eyes, but the images are vivid. I cover my mouth, but the thoughts whisper to themselves. “But you look the same, kaku.” I lied. No one looks the same after a decade. I had been to this shop before. Many times. Here I bought reams of paper and tied them into neat notebooks with string and needle, using the colored Sunday pages of newspapers as covers. This is where I bought cheap pencils and tin geometry boxes with misshapen compasses and warped protractors. This is where I bought my first fountain pen. Who uses a fountain pen anymore? When I was in school, a fountain pen was the only incorruptible writing instrument for the bhadralok. Pencils were for babies and dot-pens were not used by studious boys and girls, who could be immediately identified through their superior penmanship. So, we practiced our assignments with cheap fountain pens. There was a proper protocol to inaugurating fountain pens. We used messy plastic droppers to insert ink into the open barrels. We’d pull the ink to the nib by running the tips of fingers across the fine slit. Sometimes the ink would gush out. That was normal and not a cause for panic. The only acceptable procedure for taking care of inky fingers was to move them with one fine flourish through our hair: the wisdom handed down from generation to generation was that the ink added to the black luster. The night before major examinations, we armed an arsenal of fountain pens. We also took little inkpots with us. More often than not, the ink ran out though, this was not completely out of necessity, for we measured our peers not only by how many pages they filled, but by how fast they exhausted the ink in their fountain pens. Fountain pens projected an aura of prestige, but required a lot of maintenance. If you wanted to store a pen for a long period of time, you had to wash out the barrel with water and clean the nib. Because the angle and amount of pressure every person used to write was different, the nib of even the finest fountain pens would get bent over time (for which there were “pen hospitals”). And the finest fountain pen of them all was the Wing Sung, which you got on a birthday, or if you did well on a test. The Wing Sung which sold for an exorbitant twenty rupees was not an Ambassador. It was the Mercedes of fountain pens. It exuded elegance. It had a squeeze-injection system for the ink. A fine porcelain finish with a golden cap. It wrote smoothly for many pages before needing a fill-up. Ownership was a point of pride for every schoolboy. I got my first Wing Sung at this shop. The old man nodded and slowly turned. He pulled a series of discolored cardboard boxes from under the counter. He wiped away the dust and looked at me. Twenty years ago, he would have asked the boy in front of him, his budget. He didn’t ask the grown-up man who sat in front of computers all day, his. He opened a box and pulled out a small fountain pen wrapped in see-through plastic from the neatly arranged assortment. He took a pen from the plastic and reached for an inkpot. He put both in front of me and pulled out a small notepad with doodles scribbled all over it. I opened the pen and dipped the nib in the ink and scribbled over the pad. The patterns on the page created themselves. The writing was smooth. The lines were exquisite. Quite remarkably, all this happened without either of us uttering a word: this was a ritual that we had performed many times before. When I was in high school the ball-point pen, or dot-pen as we called them, became ubiquitous. We all started using cheap-looking Reynolds ball-point pens because we could write more pages with them. They were convenient. They were mass-produced and sold in packs of ten. They didn’t need pen hospitals. Fountain pens as primary writing instruments died out. The pen gave way to the keyboard. This much is certain. I will never regularly use a fountain pen again. I hardly use a pen for anything other than jotting down a quick note or a phone number. My handwriting, which I was once proud of, resembles the hysterical scratches of an underfed hen now. But I wonder what they call the plastic balls you have to snap off the refills before you can start writing. I always forget that step before trying to write. Never mind. I was frustrated with the typos I was making with the on-screen keyboard of the tablet, until I saw someone grapping with the much smaller keyboard of a smartphone. At the bus stop, I was standing last in line and restlessly looking at my watch, until someone stood right behind me. Later that evening, I was grimacing and cursing the ineffectiveness of a painkiller I had ingested, until I noticed that listed on the bottle were adverse effects which included paralysis and death. On hot days, I perk up when I see people wearing dark suits. While standing in the sun, I look for people with light complexions. On icy days, when pavements are slippery, I look to see if anyone is wearing high-heels. Schadenfreude need not be so obvious. Be grateful for the family that loves you, the job that you call your own, and the food you have on your table. Others are not so lucky. Gratitude implies that something scarce and of immediate value is in our possession. From the realization that others find what we have to be of value, often comes charity, an explicit acknowledgment that we are better off than others. And so the Great Machine chugs forward fueled by human misery – every miserable person in search of someone worse off until the most wretched soul on the planet is found and subjected to the full force of our collective pity and charity. Of course, charity does not shake the roots of the hierarchy. Charity does not imply role-reversal. We are better off than those we are charitable towards because of our innate qualities – we work harder, we are smarter, we possess better social skills, we believe in the real god, we are the chosen people – and not because of stochastic injustice. Our heroization is only achievable through the demonization of others. This is Aufklärung. “You have an iPod?” asks the stranger inquisitively. “I have an mp3 player, not an iPod. This one is made by Creative, not Apple,” I respond not quite sure where the conversation is going. The year is 2004. I’m on vacation in India for only a few weeks, recuperating from a PhD program in the United States. I don’t have time for long conversations with strangers. I don’t exactly remember how I answered that question. It may have been a rhetorical one. I still have the unwieldy 40 GB hard-drive from Creative which masqueraded as an mp3 player. It still works. I had my reasons for buying it instead of an Apple iPod. It had a removable battery, so I didn’t need to send it back to the company if it needed replacing. It integrated seamlessly with Windows XP, my Operating System of choice and allowed me to play .wma files I ripped directly from CDs. Most importantly, it was cheaper. But it was still an iPod. Few companies have created trademarks which have become synonymous with products. In India, it didn’t matter who made the photocopier – you Xeroxed your study notes; it didn’t matter who made the motor oil – you added Mobil to your engine. And just as in my childhood every portable cassette-player was called a Walkman, it didn’t matter who made the mp3 player – it was an iPod. As simple as that. Apple did not create the ecosystem with the iPod. That came much later. First, it created the distribution channel with iTunes. In 2001, when Steve Jobs announced an insanely cool device with a 5 GB hard drive that put “1,000 songs in your pocket,” not everyone was immediately sold. At that time, the future of record companies was in doubt. For their part they were focused on killing Napster and going after college students (who were quick to discover other peer-to-peer software platforms such as Kazaa and Limewire to share bootleg rips). CD-players which played mp3s were around. These were bulky devices that spit as CDs got scratched. I owned a few of those and even the best of the lot was worse than the solid-state or hard-drive based mp3 players that would make them extinct. With iTunes, Apple gave the vast majority of customers who wanted to legitimately purchase high-quality tracks from the leisure of their own computers, the opportunity to do so. Deprived of a distribution network, record companies became insignificant. Because they could no longer entice customers who were only interested in one or two songs to buy entire CDs, they lost out. Today, with the Kindle, Amazon is replicating the iTunes model with the publishing industry. Steve Jobs taught us that content may be king, but distribution is the entire battlefield. To go back to the beginning, I have to go back to 1984. That was the first time I ever touched a computer and it was an Apple II, an 8-bit puny contraption by today’s standards. I played an educational game on it called “Oregon Trail”. I printed long banners with ASCII characters on a dot-matrix printer. It was a magical experience. Later, as an ten-year old I’d try to write my own blatant rip-offs of “Oregon Trail” spooling together lines of BASIC on a Tandy-Radio Shack abomination. One of my father’s colleagues got a Mac in 1986 and I remember looking at the mouse that came with it with a sense of wonderment. At that time, of course, I didn’t know who Steve Jobs was. It is now well known that Bill Gates’ Microsoft had a penchant for replicating many of Apple’s features. As a confirmed PC-user, features such as the graphical user interface worked wonders on installments of Windows. If you remember the hourglass icon that used to be on earlier version of Windows, you’ll know how the rotating blue-circle is inspired from Apple’s OS. Like Bill Gates and the more recent internet icon Mark Zuckerberg, Steve Jobs was famous for his arrogance. When there were issues with the antenna of the iPhone 4, he quipped “you’re holding it wrong.” In his first stint with Apple, he was described as temperamental. When Apple was an underdog throughout the 90s, his spirit came across as praiseworthy. In recent times, he had been berated for his use of superlatives and dismissal of genuine concerns with products. But he hired and inspired technical geniuses who packed power with Zen simplicity. And technical glitches got fixed with lighting speed. In 2010, the internet was abuzz with a new tablet which an emaciated Steve Jobs had come on stage to introduce. The “iPad” jokes floated on Twitter for days. Who would want an iPad? How will we get by without Flash-support? How can we live without USB ports and front and rear facing cameras? I have to admit that I was in the camp of naysayers who thought of the iPad as a glorified iPod touch. In a year, I’ve gone from skeptic to believer and now I own not one but two second-generation iPads. When Steve Jobs came on stage to announce the iPad, he was making a huge gamble. Essentially, he would have to create a need for a product when one didn’t exist (or more accurately, he would have to convince customers that they always needed a product, but they just didn’t know it). A year is a long time in politics, but I’ll wager that it an even longer time in tech. When Jobs announced the “transformational iPad,” netbooks were the Next Big Thing. The consensus was that Apple would be launching a netbook –essentially a lightweight stripped down version of a laptop computer. Competitors, who scoffed at the iPad abandoned their netbooks to go back to the drawing boards. As is the case with every technological device resulting from a disruptive innovation, they will eventually catch up. It was a bold risk, but by putting his firm belief in a new device and the weight of a technological powerhouse behind it, Jobs killed the netbook. He created the fastest-selling device in history. For better and for worse, the products Steve Jobs has created have influenced my life. I’ll miss him.